On this date in 1400, English aristocrat John Holland, Earl of Huntingdon and (formerly) Duke of Exeter, lost his head for the Epiphany Rising. John Holland’s coat of arms. 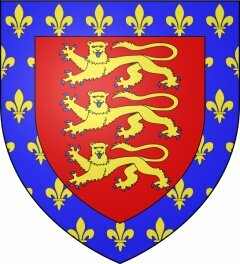 Half-brother to (and staunch ally of) Richard II, the violent John Holland prospered during the king’s acme in the 1390s. A variety of lucrative posts accumulated as honoraria for Holland’s exertions in the military and political fields. Most memorably, Holland helped in 1397 to destroy the leaders of the Lords Appellant, who in 1388 had clipped the king’s wings with a successful revolt. Within days of the murder of Thomas of Woodstock and the execution of Richard FitzAlan, Holland was elevated to Duke of Exeter. Unfortunately for “Exeter”, a fellow Lord Appellant named Henry Bolingbroke was about to successfully depose Richard II, and style himself Henry IV. Holland’s loyalty to the former King Richard, now held under lock and key, became distinctly impolitic. Having been dispossessed of the Exeter title, earned by service the new sovereign did not consider meritorious, John Holland got in on a plot to kidnap Henry IV during a tournament at Windsor … which devolved, when Henry found out about it, into an abortive rising with a number of executions. Richard FitzAlan’s sister (also Henry IV’s mother-in-law) had the satisfaction of ordering Holland’s beheading at Pleshy Castle, Essex. Holland’s loyalty to Richard II ultimately did them both in: because the Epiphany Rising so graphically illustrated the danger that a living rival claimant posed to Henry IV, the king had his imprisoned predecessor murdered behind dungeon walls that February.